We hope you find this both informative and fun. Britain was just recovering from the “three day week” and there was little in the way of green shoots of recovery. Harold Wilson was prime minister and Margaret Thatcher became leader of the Conservative Party. The average house price in the UK was £12,000, a gallon of petrol cost 72p and the male working population received an average salary of £4,000. Tiger Woods, Angelina Jolie and David Beckham were born. Bill Gates and Paul Allen founded Microsoft. In Nottingham, England, two teenagers who had met seven years earlier, danced together on ice for the first time. 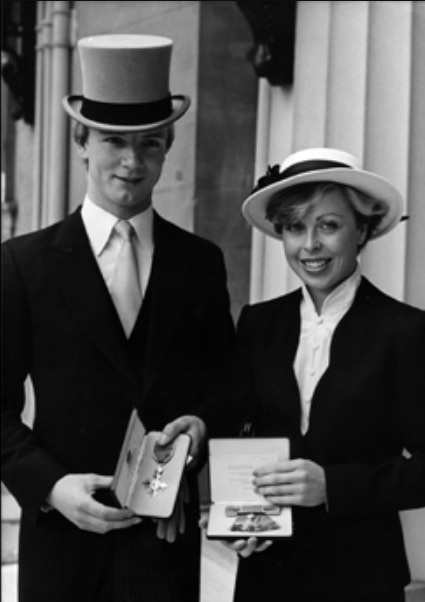 They were to become the ying and the yang of their sport, their names linked in immortality: Torvill and Dean. Jayne worked as an insurance clerk; Chris was a trainee policeman. But under the watchful eye of their coach, Janet Sawbridge, they won their first competitions in Sheffield and Bristol, and then in St. Gervais, France. They were on the way to becoming sporting legends. In Oberstdorf, Germany, they came 2nd at an international competition, followed by a 4th place finish at the British Championships. That same year at the Winter Olympics in Innsbruck, Austria, Ice Dancing was introduced for the first time and the British skater John Curry took Gold in the men’s event. 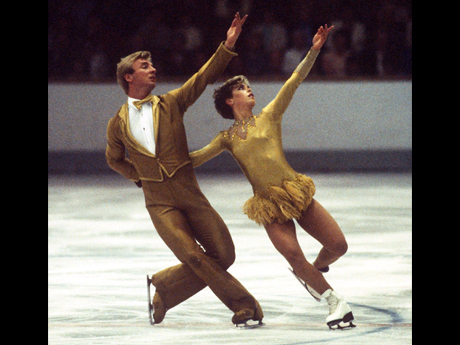 Unlike some Eastern European competitors, there was no likelihood of Jayne and Chris giving up their jobs and committing full-time to skating. Every morning and evening they would practice, until Chris left the area to continue his training as a policeman. Dedication was called for. And it paid off when they came 1st in Oberstdorf and 3rd at the British Championships. This meant they qualified to compete at the European and World Championships the following year. Steady progess. 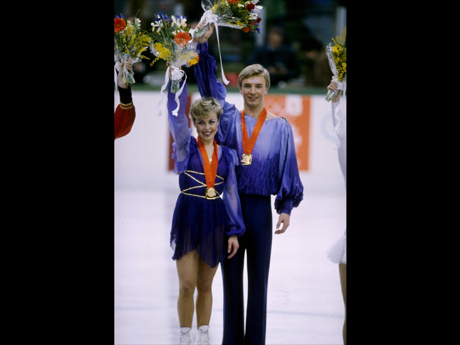 At the European Championships in Strasbourg, France, Jayne and Chris ended up in 9th place and 11th at the World Championships in Ottawa, Canada. They returned to Nottingham with renewed determination. 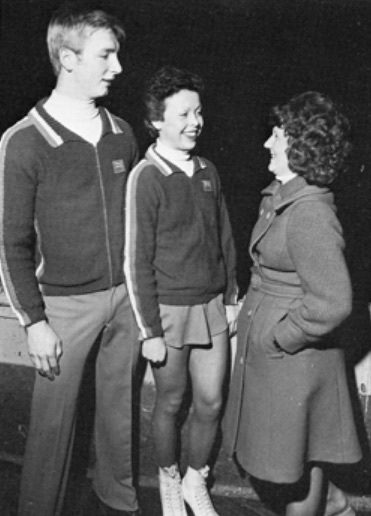 The highly respected coach, Betty Calloway, agreed to oversee their training and they began taking ballet classes. In November, they won the British Championships for the first time, an achievement that repeated itself for the next 6 years. They were placed 6th at the European Championships in Zagreb, Yugoslavia (now Croatia) and 8th at the World Championships in Vienna. The main focus was skating and working. There was little time for a social life. Early mornings and late into the night were spent at cold ice rinks. They became British Champions again. A major breakthrough. 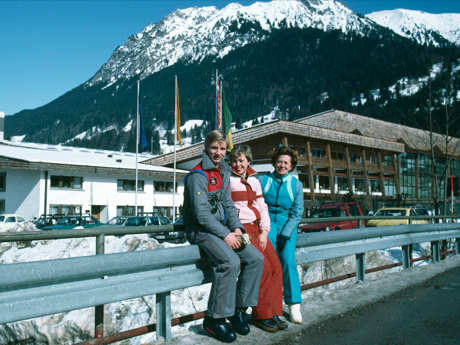 After coming 4th at the Europeans Championships in Gothenburg, Sweden, Jayne and Chris participated in their first Winter Olympic Games, held in Lake Placid, USA. They came a respectable 5th but it was Robin Cousins who stole the show with his Gold Medal in the men’s event. At the World Championships in Dortmand, Germany, they moved up to 4th position. It was now to be all or nothing. Chris resigned from the police and Jayne left her job soon afterwards. Faced with no income, Nottingham City Council came to the rescue with a grant, which raised eyebrows in some quarters. They began training more and more on the Continent, where they were given far more time on the ice, particularly in Oberstdorf, Germany. British Champions for a third time. They were not expected to win the European Championships, in Innsbruck, Austria. The Russians had dominated the sport for the past 12 years. But on a glorious night for British skating, Jayne and Chris became European Ice Dance Champions and six weeks later in Hartford, Connecticut, USA they achieved their 1st World Championship Gold medal. Suddenly, Jayne and Chris were the new darlings of the British media, their relationship off the ice a subject of continued speculation. 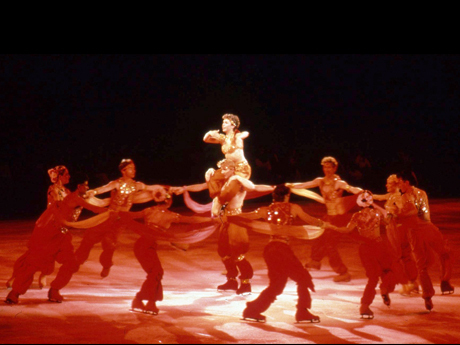 Ice Dance at that time comprised three sections: Compulsory Dances, Original Set Pattern Dance (now called the Original Dance) and the Free Dance. The nine judges would give marks out of 6 for Technical Merit and another for Artistic impression. The marks for each section were then added together to achieve a total score at the end of the competition. 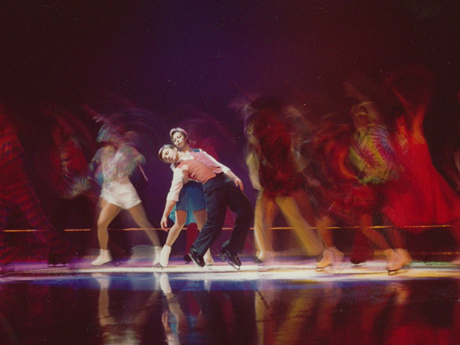 The music for the compulsories was chosen by the International Skating Union and made up of traditional ballroom rhythms, such as waltz, foxtrot, tango. The Original Set Pattern Dance SP was a set tempo chosen by the ISU for which you could chose you own music: for example, blues, paso doble, rock and roll. For the Free Dance, you were ‘free’ to use any music of your choosing as long as there were no vocals and it was no longer than 4 minutes 10 seconds. Most ice dancers chose a medley of music, edited together, featuring different tempos to show off their skills. Jayne and Chris had always followed this style of presentation but yearned for more ways to express themselves. After much deliberation and consultation, they opted for the Overture from the stage musical, Mack and Mabel, as their Free Dance. It would be the first time a single piece of music had been used to tell a complete story. For the Blues OSP, they chose a version of Summertime performed by the American harmonica virtuoso Larry Adler. They triumphed at the British Championships and to complete a perfect year, they went to Buckingham Palace to be awarded an MBE by HRH Queen Elizabeth. They were also named ‘Team of the Year’ by BBC Television. 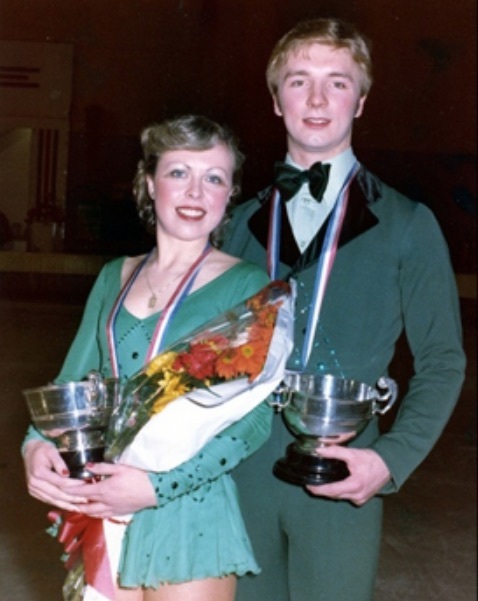 At the European Championships in Lyon, France, Jayne and Chris retained their Championship title and scored their first sixes in overseas competition, three for Summertime and 11 for Mack and Mabel - a total of 14 out of 18, which was a record for an International Championship. They were also triumphant for the second time at the World Championships in Copenhagen, Denmark. backstage and a formidable partnership was formed that would prove to be unbeatable. prepared for the British Championships and the International season ahead. Crisis. A fall in practice just days before the Europeans in Dortmund, Germany, left Jayne unable to compete. They withdrew from the competition. 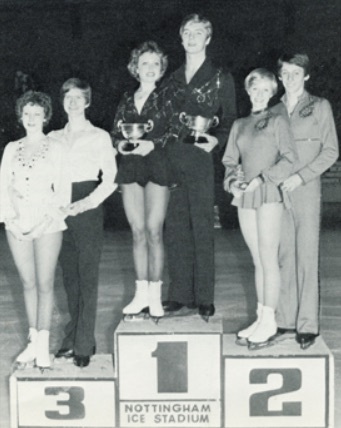 Jayne and Chris arrived in Helsinki, Finland, for the World Championships only weeks later and, with Michael Crawford looking on, they retained their international crown. The judges’ marks surpassed those of the previous year with 6 sixes for their OSP and for Barnum, a row of 5.9’s for Technical merit and an unprecedented 6 from every judge for Artistic impression. Breaking all previous records, they had dominated the event. The Winter Olympics were less than 12 months away. 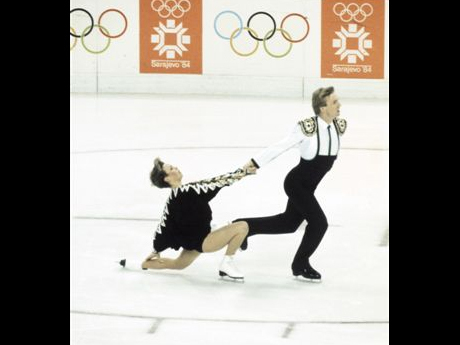 Jayne and Chris were redefining ice dancing. In particular, they had devised a plan to use music during which the tempo remained constant but the intensity and drama increased. They had been dancing to Ravel’s Bolero in training to warm up. The overture was 17 minutes long but competition rules stipulated that the dance routine in the Olympics must be no more than four minutes long, give or take 10 seconds either way. Composers Richard Hartley and the late Bob Stewart shortened it, rearranged it and shortened it some more but it was still too long by 28 seconds. Jayne and Chris, who always choreographed their own dance routines, came up with an ingenious solution. They would make sure their skates did not touch the ice for 18 seconds once the music started. Six months of hard training in oberstdorf followed and then the British Championships. Victory secured them their 5th title. The European Championships came first. The OSP for this year was the Paso Doble and the Torvill and Dean performance is remembered as being their best ever, scoring six 6’s for Artistic impression. Bolero gained them a further 11 and the stage was set for the Winter Olympic Games in Sarajevo, in the former Yugoslavia, now Bosnia and Herzegovina. Leading the competition from the outset, their Paso Doble scored sixes again. On February 14th, more than 20 million people in the UK and millions more worldwide, watched on television for 4 minutes and 28 seconds as Jayne and Chris delivered a flawless performance of their Bolero. It was Valentine’s Day. Passions were running high. Some people worried that the judges might think the routine too radical, Ravel’s haunting score too extreme, their costumes too whimsical. Nothing of the kind. The nine judges reached for the sixes and awarded Jayne and Chris maximum points. It had never been achieved before – and never since. They had won the gold medal in emphatic fashion. 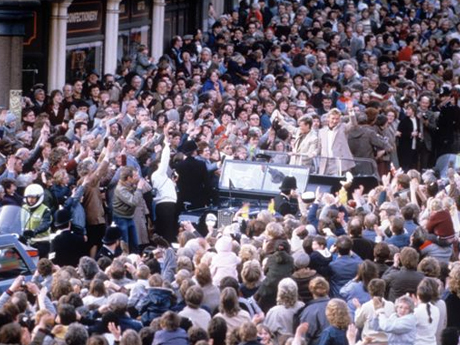 thousands turn out to greet them in a victory parade. All this time, Jayne and Chris had relied on grants. Their financial future was far from certain. 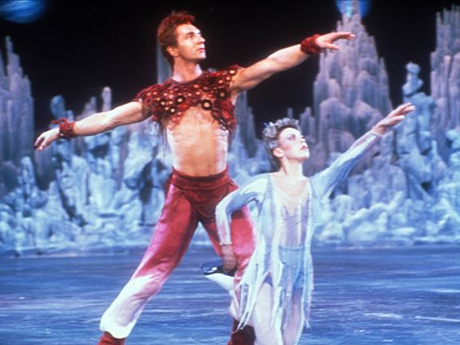 There were options to join a number of ice shows as guest performers, but they harboured a desire to put together their own company of skaters and bring their style of ice dance to the millions who had supported them over the years. routines for their first World Professional Championships in the USA. the end of which Jayne and Chris appeared to tumultuous applause. time it had been given to two people. They returned to Australia to prepare for Torvill and Dean: The World Tour. Graeme Murphy became co-artistic director and after assembling a company of top international ice skaters, rehearsals were held in a disused warehouse in downtown Sydney. Three months later, a few try-out shows were performed in New Zealand and Australia, then the entire company was transported to Oberstdorf for final rehearsals before the opening at Wembley Arena, London, England in the summer. Capacity audiences for eight shows a week with a run of seven weeks ensured that almost half a million people watched the show. 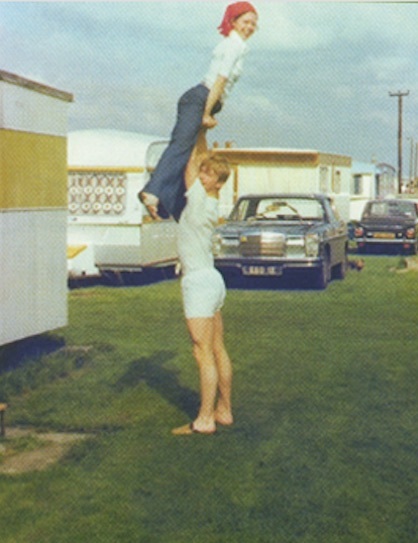 They also performed in Nottingham – in a specially designed circus tent - where they were given the Freedom of the City. It had been a busy year, at the end of which they won the World Professional Championships in America for the second time. 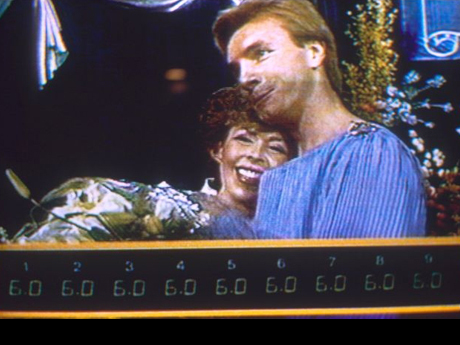 Torvill and Dean: The World Tour went to North America, opening in St Johns, Newfoundland in January and toured throughout Canada, performing in enormous ice hockey arenas. After a short break, the show moved to the southern hemisphere and Australia, including performances in Tasmania in the circus tent, last used in Nottingham a year earlier. the UK and won the Bronze Rose at the Montrose Film Festival. Then the company went back on the road for the North American leg of the tour. on the schedule. The company was disbanded. With nothing they could do on the ice, Jayne flew to Australia for a well earned holiday. Chris headed for London to try out tap dancing and singing lessons. Filling in the time until he and Jayne could get back to work. 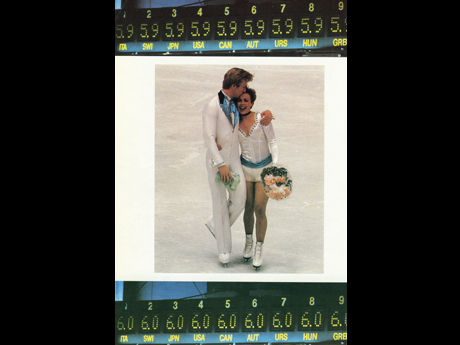 Wrist healed, the most famous of American ice skating shows, The Ice Capades, offered Jayne and Chris a place on its tour. They performed without the responsibility of running their own show – but the dream of rebuilding a company once more was never far from their minds. Chris found the time to work with the French/Canadian ice dancing brother and sister, Isabelle and Paul Duchesnay, and choreographed their Jungle routine. Jayne and Chris officially opened the first outdoor skating rink at Broadgate, in the City of London and appeared at the Prince of Wales Theatre as part of a charity event, performing a scene from Noel Cowards ‘Private Lives’. Jayne and Chris began working with their second company of skaters, the Russian Allstars, whose artistic director was Tatiana Tarasova. Tatiana had been a rival for many years at European, World and Olympic competition. After months of rehearsals, the first performances of a show that was destined to run longer than the World Tour began in Moscow, followed by St Petersburg. It then went to Australia and New Zealand. 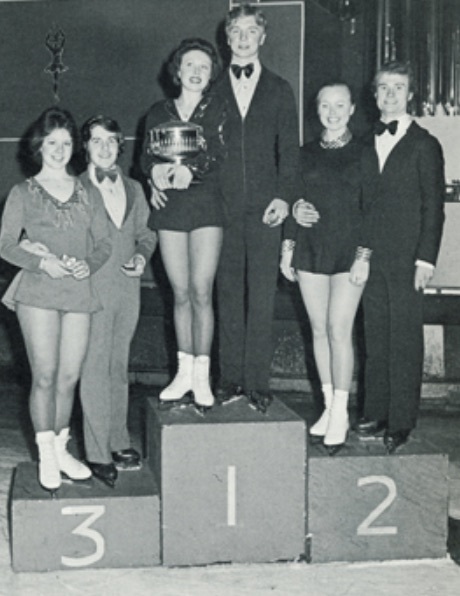 Chris had again found the time to work with the Duchesnays and passed on to them a routine that he and Jayne had been performing regularly on the tour, Eleanors Dream. The Duchesnays won bronze medals with it at the European and World Championships. Torvill and Dean and the Russian All Stars continued in Australia. Things came to an abrupt halt when Chris, invited to participate in a celebrity NASCAR race in Melbourne, crashed and tore a ligament. 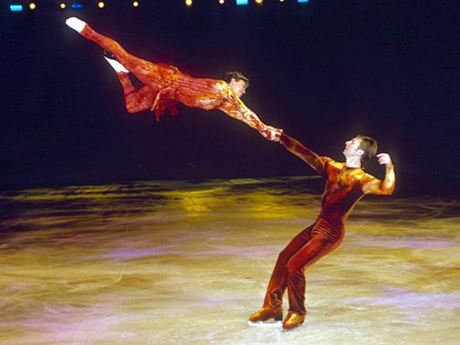 After an operation, he spent the next two months in plaster which led to perhaps the oddest Torvill and Dean duet. They were persuaded to make a CD by Australian music producer Kevin Stanton, singing 14 cover songs by artists such as the Mamas and Papas and Sonny and Cher. ‘Here we Stand’ was released only in Australia in June of that year. 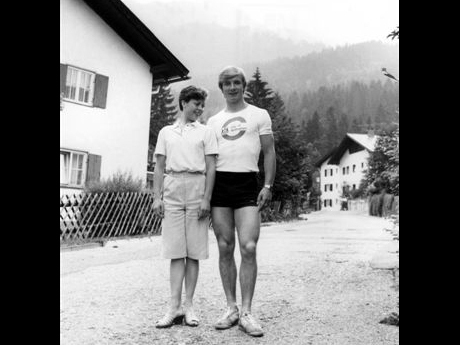 Jayne and Chris returned to England and then went to Oberstdorf to choreograph new dances for the delayed American leg of their tour, which began in September. They also worked with the Duchesnays again. This time passing on Missing, a routine that had been a particular highlight of the Australian tour. Jayne met Phil Christensen, an American from Chicago and Chris began dating Isabelle Duchesnay. Within a year, both couples would become engaged. A leading UK impresario, Phil McIntyre, brought the tour to the UK and it played all over England, Scotland, Northern Ireland and Wales. It was the longest running tour they had ever done. 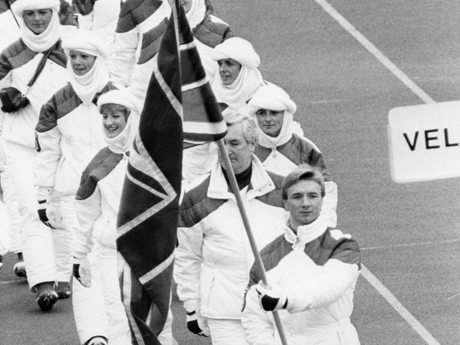 All the Russian skaters could speak English by the end of it – and some of the British skaters had learnt some Russian. Jayne and Phil were married in Sacramento, USA on September 21st. Chris worked again with the Duchesnays and choreographed Reflections, which would be their Free Dance for the new season. After an absence of 5 years, Jayne and Chris decided to compete at the World Professional Championships in the USA once more and secured victory for the 3rd time. They also took part in the inaugural, Challenge of Champions, competition being held in Barcelona, Spain. They won that, too. Having been approached by the BBC to film a documentary for their Omnibus series, a piece of music was commissioned, named Tilt. After weeks of rehearsals at Alexandra Palace in London, it was filmed and aired under the title Bladerunners later in the year. As the Duchesnays’ Reflections had not attracted enough marks from the judges at the European Championships to improve their position in the competition, the decision was made to choreograph a new routine, Missing 2, for the World Championships a mere 6 weeks later. The gamble paid off: Paul and Isabelle were crowned World Champions. Chris and Isabelle were married in Quebec, Canada on May 18th. decided to create a new show for Britain. would be skated to music from the musical West Side Story. The Duchesnays won the silver medal at the Winter Olympics in Albertville. Rehearsals began in Kiev for the new production The Best of Torvill and Dean, which would also guest star Robin Cousins. 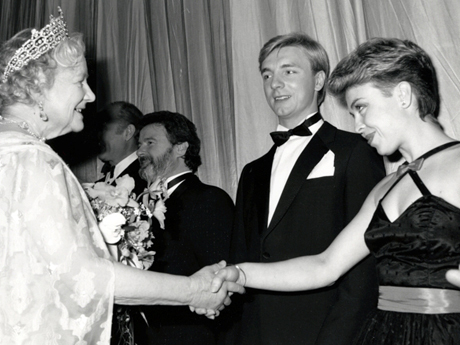 During rehearsals, Jayne and Chris were invited by the International Skating Union, the governing body of their sport, to a dinner in Davos, Switzerland as part of the organisation’s 100th Anniversary Year celebrations. 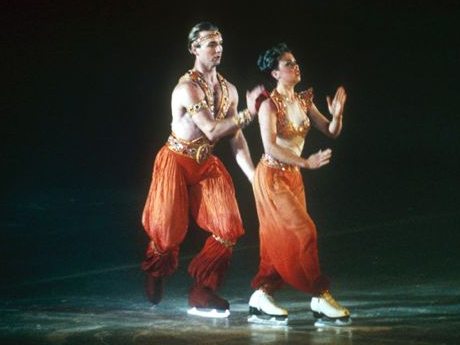 They were to learn of rule changes that meant professional skaters would be accepted back into the Olympics if they relinquished their professional status. 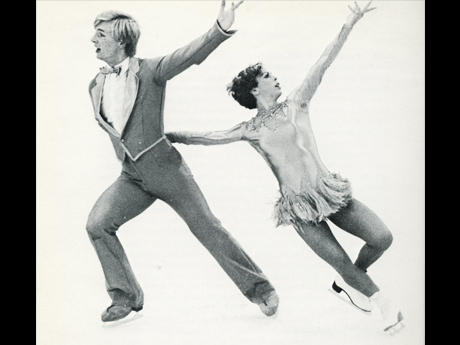 Jayne and Chris performed in the Tom Collins Tour of Champions across North America. They choreographed a new piece entitled Drum Duet to the music of Phil Collins. Chris and Isabelle separated and were divorced shortly afterwards. 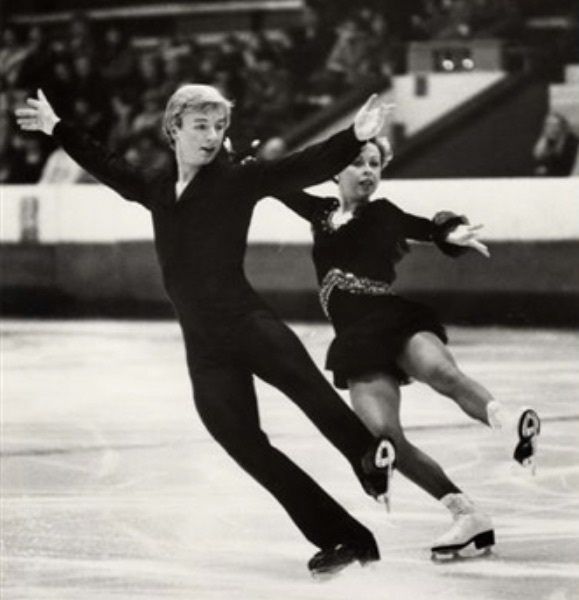 Jayne and Chris were awarded Honorary Master of Arts degrees by Nottingham Trent University for services to ice dance and contribution to its development as a creative art. They travelled to Boston, USA to take part in Skates of Gold, featuring performances by 24 Gold medal winning ice skaters. 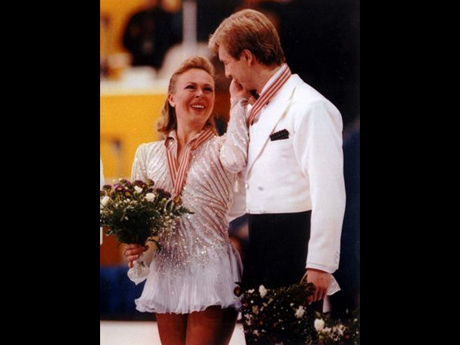 Jayne and Chris announced that they would compete as amateurs once again – 10 years after their Olympic success with Bolero. At the British Championships held in Sheffield, Jayne and Chris led after the Compulsories, their Rumba Original dance scoring all 5.9s and 6s, bar one judge. The Free dance, skated to a specially arranged, orchestrated and recorded version of Fred Astaire and Ginger Rogers’ Lets Face the Music was a triumph. It scored eight 5.9s and a 6 for technical performance and all 6s for artistic impression. 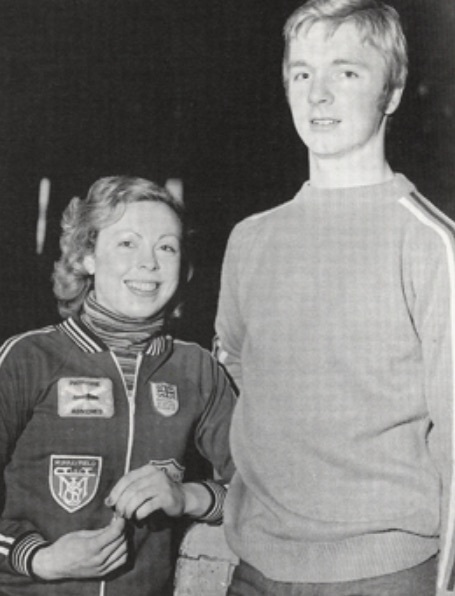 Two weeks later at the European Championships in Copenhagen, Jayne and Chris faced their Olympic rivals in competition for the first time. They won - but only just. Back home, they changed their free dance from an intricate, clever and intensely technical programme to a much more athletic, joyful dance. They added steps that had been memorable from older dances such as Mack and Mabel and Barnum and hoped that the judges would look more favourably upon them a couple of weeks later. 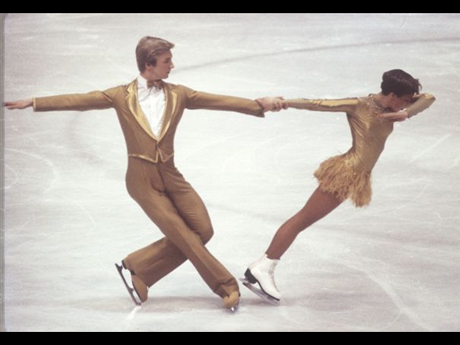 At the Winter Olympics in Lillehammer, Norway, they came a disappointing 3rd after the Compulsories, but no-one could touch Jayne and Chris’ Rumba and they won the Original dance section. 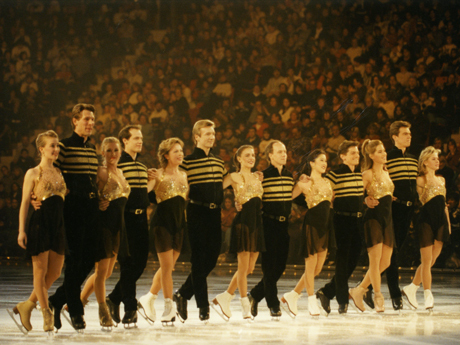 They took to the ice for Lets Face the Music and treated the audience to an exceptional display of ice dancing. As the music finished, the crowd rose as one cheering, stamping, whistling. The judges had other ideas and awarded them the Bronze medal. Seven weeks after the Olympics, their new show, Face the Music, opened in Sheffield. The response was overwhelming and went someway to make up for the disappointment at the Olympics. After it’s UK debut, the show travelled to Australia and North America. Chris married former U.S and World Ladies Figure Skating Champion, Jill Trenary, in her home town of Minneapolis, USA on October 15th. 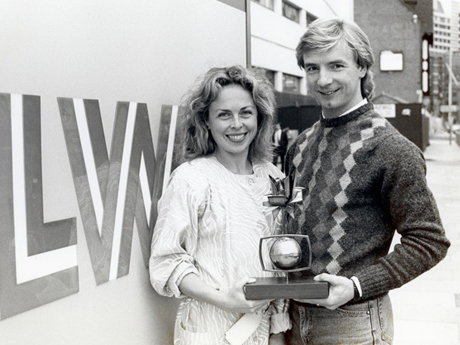 Torvill and Dean were part of the European Team, alongside Robin Cousins, in the inaugural World Team Championships held in the USA. Europe finish 3rd, behind the USA and Canada, with Russia in 4th but Jayne and Chris won the Dance section. The Face the Music tour returned to the UK and finally finishes its run on August 1st. It had been seen by more than one million people. Jayne and Chris’s official autobiography, Facing the Music, was published by Simon and Schuster. 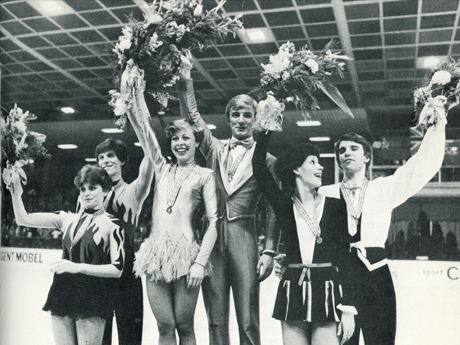 They were honoured by the German Figure Skating Union for their contribution to the sport. In December, they competed in the World Professional Championships and the Team Championships in the USA and the Challenge of Champions in London, England. They won all three competitions. 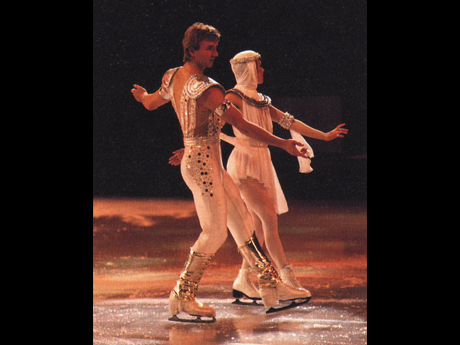 Jayne and Chris were invited to perform with Stars On Ice, which was managed by IMG. This was in Tokyo, Japan and featured a cast of past Olympic, World and National Champions. Chris was commissioned by Derek Deane, the Artistic Director of the English National Ballet, to choreograph a dance for their new season. Using the music of Paul Simon, Chris’s ballet was called Encounters and premiered in Cambridge in June. The piece was well received and toured the UK as part of a triple bill before opening at the Royal Festival Hall, London, for a short season. 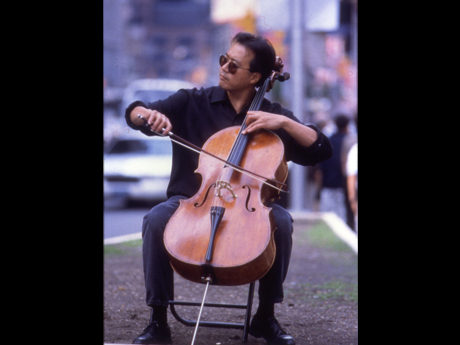 Bach did for the cello’. They competed again in the Team Championships, the World Professional Championships and the Challenge of Champions and again won all three. 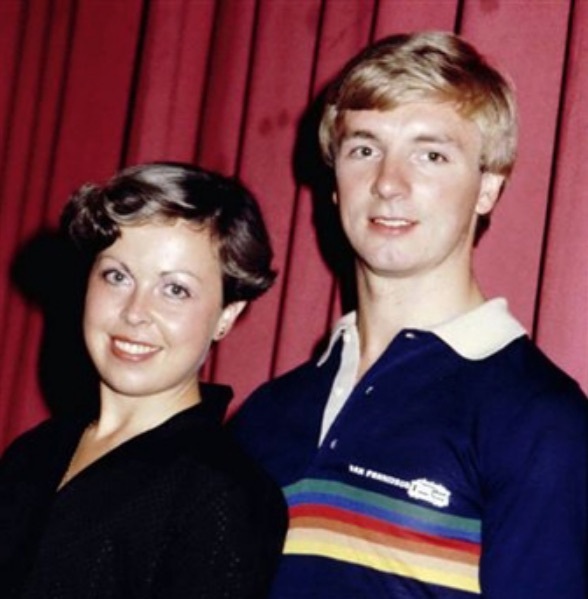 Torvill and Dean performed again with Stars on Ice, touring the USA and Canada. Jayne and Chris began planning a new show, collaborating with Robin Driscoll, who wrote the Mr Bean film scripts, starring Rowan Atkinson. What would be their last touring show, Ice Adventures, premiered in Birmingham, England. Ice Adventures was performed for the last time, closing at the Sheffield Arena. 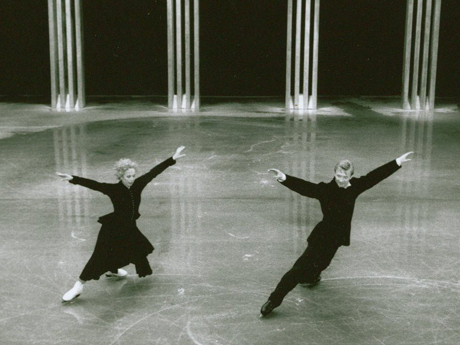 Jayne and Chris flew to the US to perform once more with Stars on Ice. They choreographed a new routine especially for the show to Paul Simons’ Still Crazy After All These Years’. Secretly, they had decided that this would be the last time they would skate together, bringing to a close a 23 year ice dance partnership that was the most successful of all time.